Some of you might recognise it from these parts before, and you would be correct; many thanks to Brocklanders023 for responding to a half-hearted post saying I wouldn't mind a classic Saracen. After a few weeks here it is. It is, I believe, a 1989 spec frame with 1990 bits on it - 500LX mainly (but a rear U-Brake), so not particularly high spec, but functional. I'm not sure whether to upgrade the bits to 1989 spec stuff, better 1990 stuff which I have, or just leave it. The chainset is in great condition, but I know they are quite heavy, so an XT one might be on the horizon. 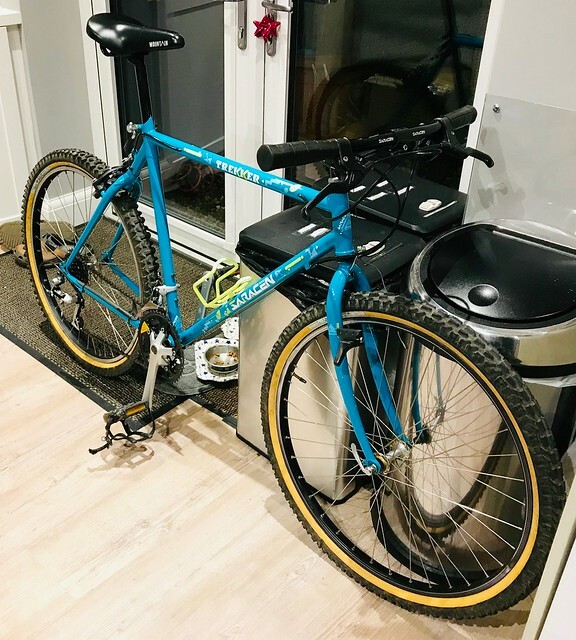 The whole bike is quite heavy, but I guess a steel seat post, sprung saddle, steel stem and bars aren't going to make for a svelte steed. Still, it's not much of a concern as it feels well built. A few things to fettle to my liking before it's ready for a ride. The frame is in such good condition that I think it will be a fair-weather rider, so probably won't be going out on it anytime soon, unless we get a very dry spell, or I just potter around with the kids. I'll get some more photos when it's light if anyone is interested, but you've all seen it before so don't want to bore you. Just can't get over what a great looking bike it is, and just hope it rides nearly as good as it looks. 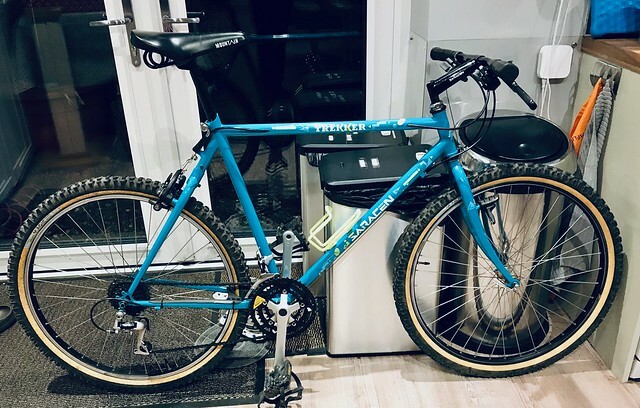 WAS SEARCHING FOR: 1989 Marin Bear Valley, 19"
Ace the condition of the bike reminds me of Christmas Day 1988 when I got my first mtb , a Trekker (model year ‘88). Have been considering doing a nostalgic festive rebuild if there’s time...enjoy yours, they great bikes. It's very nostalgic. I had loads of catalogues back then and the 1989 Saracen catalogue really jumped out as being of a new design style. Loved the graphics, still do, and the layout was interesting. There wasn't a Saracen dealer near me so it never happened. Lovely bike, really need something similar myself. My two Saracens are 93 and 94. So jealous... I have a Tufftrax frame/forks & nothing else, need to start collecting parts, hope it looks as good as that! Nice that, they got it so right in the early days didnt they.